In March 2000, Le Nian Laoshi (as Bro. David Liao is affectionately known in the local village) retired from his teaching profession in Malaysia and decided to serve the children in Huliao Changjiao village, the place where his grandfather was born. As is with everything, the beginning of his new mission was full of challenges. At first, some local folks doubted that in this materialistic world, anyone would provide services without asking for something in return. With diligence and great perseverance, Bro. David showed them the stuff La Salle Brothers are made of. He soon gained their trust and confidence and became a highly respected Laoshi, well loved by the children, parents, residents of the local and nearby villages. “Dear readers of e-Lasallian. Greetings from La Salle Study Centre, Changjiao, China. I pen this short article at the request of Mr. Ng Soon Hong on behalf of e-Lasallian. With the handover of Hongkong back to China in 1997, it was a natural decision that the Brothers’ Lasallian Education Service, which is already firmly rooted in Hongkong, should embark on an initiative to undertake a completely gratuitous Out-Reach Mission in a rural setting in mainland China. 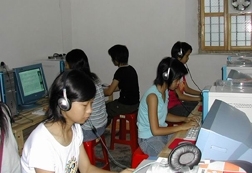 In 2001, Brother David Liao was assigned to make the attempt to establish this foundation. Br. David reported to Hongkong in March 2001 and started learning Putonghua. 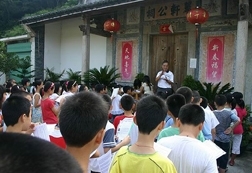 A series of events led BD to Changjiao, his ancestral village in 2001. 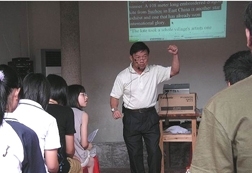 At the invitation of the village elders and leaders BD started teaching English in 2002 at Changjiao’s Primary School. The first two years were difficult. There were many misunderstandings that finally drove BD to move out of Changjiao’s Primary School to teach in his nephew’s house in 2004. BD rebuilt my grandfather’s house in 2005 to cater to fast growing demand for admission. The name La Salle Study Centre was officially used for the first time on Easter Monday, 17th April 2006. It will always be remembered by all in Changjiao as the day Liao Laoshi’s mysterious La Salle Hui Guan Tong Shi (roughly translated as Lasallian Family members) finally turned up. BD always reminds them that it is through the support of La Salle Hui Guan that he is able to run LSSC gratuitously. The visit of the Old Boys Association of La Salle College Hong Kong greatly enhanced the credibility and reputation of LSSC. The villagers welcomed the guests with the traditional drums and gong. A notable landmark event was in September 2008 when the County of Dabu granted official recognition of the educational service rendered by LSSC in uplifting the standard of English in Dabu by honouring BD with the Dabu County Award of 道德楷模 (Prominent Person in Public Service). LSSC is officially recorded in Dabu government website, had been featured twice on Dabu TV in 2008 and appeared in Guangzhou Yang Cheng Wan Bao [5th Aug 2008] and Meizhou Ming Bao [7th Aug 2008]. LSSC is widely acknowledged as an effective English Learning Centre in Dabu. LSSC’s Annual Summer English Reading Programme attracts students from many parts of Guangdong and Fujian and even as far north as Heilongjiang. The demand far exceeds the 450 students accepted each summer. LSSC’s weekend English classes are always in high demand and well attended. 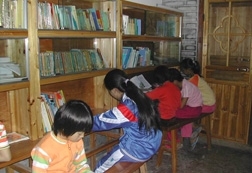 For the students in the village of Changjiao LSSC provides opportunities for computer literacy, music and dancing and a quiet study environment. LSSC has an Annual University Fees Subsidy programme for Changjiao’s students that cover at least half the annual university fees. This programme began modestly in 2004. There are 4 graduates from this programme thus far. They are a civil engineer, a lawyer, a graduate in international finance and a post graduate student with a Masters degree in psychology. On the average, LSSC sponsors 8 students a year, approximately two per year of the 4 years at university. LSSC has been financially supporting the local primary school since 2004 and in September 2008 LSSC fully sponsors the local Kindergarten. La Salle Study Centre, Changjiao now runs on a yearly budget of about RMB150,000. A rough breakup of the annual expenses are as follows: University Fees Subsidies RMB40,000-50,000; Subsidy to local Primary school RMB15,000-20,000; Sponsorship for Kindergarten RMB15,000-20,000; Summer Programme RMB20,000-30,000; Community Development Projects RMB10,000-25,000. Maintenance and Utilities RMB12,000-15,000. Funding for this project is entirely dependant on the generosity of Lasallians, Lasallian PTAs, friends and relatives. I take this opportunity to thank all who have supported this project since the beginning. I do not mention names but I assure you that I keep you always in my prayers. I am fully aware that this “adventure” in Changjiao will not be possible without your help. To those who have visited us, we are deeply grateful. To those who feel like visiting us, we say “Welcome Lasallians”. Education at the Centre is provided free of charge. To ensure that it provides a quality, competitive education, modern teaching aids, computers and other facilities have to be acquired. This necessarily costs lots of money. Thus, he has to source for funds each year to keep the La Salle Study Centre running. Bro. David’s mission depends much on the generosities of his relatives, friends and Old Boys whose hearts he has touched. He is now back in Kuala Lumpur. This provides a good opportunity for friends and Old Boys to meet up with the good Brother. He will be at the La Salle Provincialate, Petaling Jaya as from the 15th November till early January. I am sure he will appreciate any expressed support of his project in Chianjiao.